Day 20! I get it, I hear it from a bunch of you a lot.. I'm obsessed with Unibroue, and apparently I don't drink beer from other breweries (I do, see previous photos). Nobody seems to criticize me for my love of Half Pints. In Fact, I spend far more on Half Pints than Unibroue any given month. Well, we all have that one brewery that just makes us.. happy. Unibroue to me has changed my life.. pushed me into craft beer, helped me in bouts of depression more than any person ever has (and I'm not talking about getting a buzz), it's just part of being me. The ONE Unibroue beer that I haven't had in the longest time out of any other is Don de Dieu, AKA "Gift of God", while this isn't a La Fin du Monde with tomorrow being the fauxpocalypse, I'm treating myself to of the Gift of God instead. I haven't had this beer since early 2008, when it was available in one of the very first Unibroue Christmas taster packs, and never had a bottle ever since then as it sold out immediately, which was surprising as craft beer sales were pretty stagnate back then in Manitoba. Appearance: Pours a honey-orange-amber, almost reminds me of GoodHost iced tea in the summer time, you jam pack so much "tea crystals" into a glass to get the ultimate sweetness out of it.. while my grandmaman yells at me for knowing my limits. The foam reminds me of the iced tea too, a thin light beige foam that gently touches the edge of the glass and no more, no less. There's also a really nice amount of sediment, which shows that folks - some beers are meant to be aged! Sure nowhere near as much sediment as my Quatre Centième will have, but still quite nice. Aroma: That "Unibroue aroma" is quite strong in this and yes, most Unibroue beers have the same sort of yeasty aroma. The yeasty aroma is followed by oranges, lemon, coriander, slight bready and more yeasty goodness. Taste: It's been nearly half a decade.. but it's the same as I remember. On the tongue it's a bit tingly and carbonated, flavours consist of the standard yeasty taste, a bit of a bitter aftertaste, a great deal of citrus backing it up (lemon and a hint of orange) and also an alcoholiness to it. I would put this in between a Blonde de Chambly and La Fin du Monde in flavour. Overall Thoughts: I like it, but it's not something that will ever be on my list of "top beers", while tasty, it lacks something that distinguishes much. The floating sediment made me giddy for joy but I don't know if it really improved the beer much either. The beer was bottled March 30, 2011, so nearly 2 years old (and exactly one year older than the batch of Unibroue 17s I'm hoarding). Glad I wasn't able to buy a special order of Don de Dieus from the LC, but its citrusness and carbonated feel would be well welcomed in the summer time. It also has 8% ABV so a bit of warmth will take place by drinking this beer - but not enough to numb one self for the upcoming fauxpocalypse! 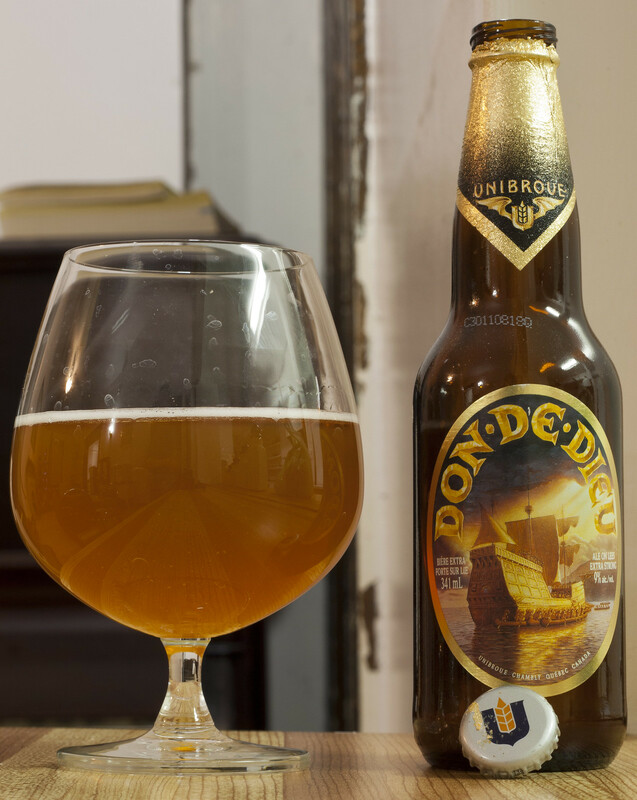 Don de Dieu Tripel White Ale: The Don de Dieu in Tadoussac, June 3, 1608, under the command of Samuel de Champlain de Brouage, commissioned by the King of France to pursue the exploration of this vast and inhospitable land called America.